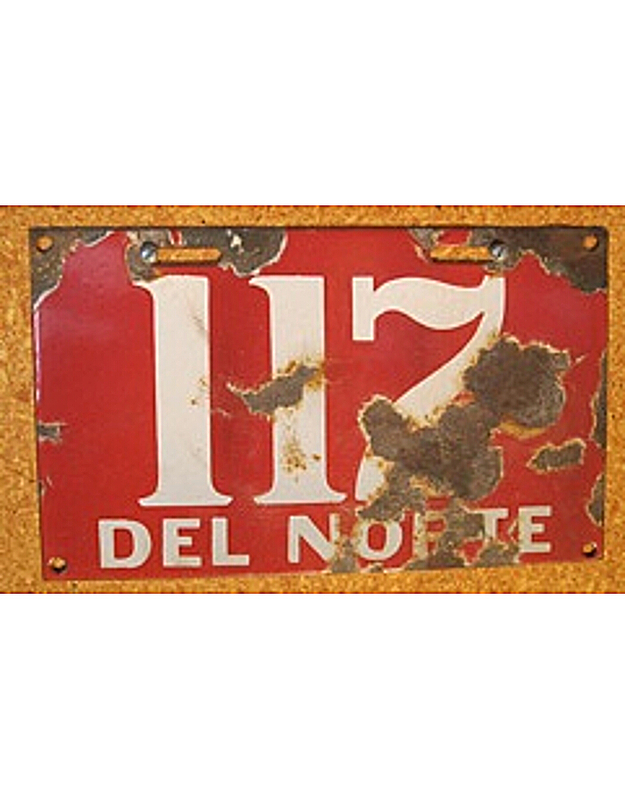 There was no uniform statewide licensing of autos in Colorado until 1913. 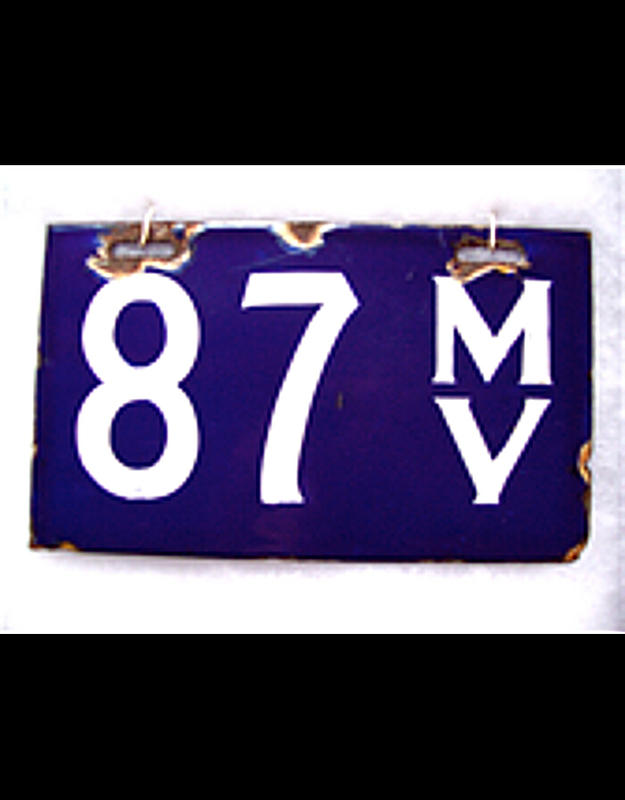 Prior to that date, and perhaps as far back as 1904, certain cities and towns were registering motor vehicles. 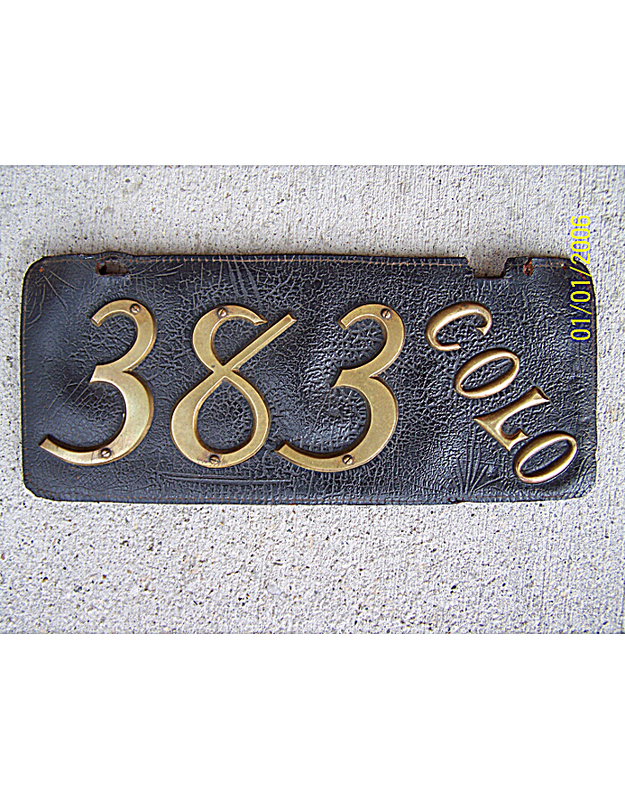 Certainly by 1906, the City of Denver was beginning to issue license numbers, with owners having to provide their own pre-state plates. 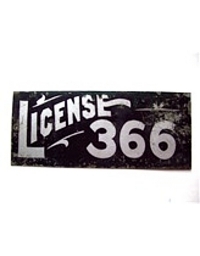 A major problem with Colorado local licenses is that almost none included positive identification as to the city of origin. 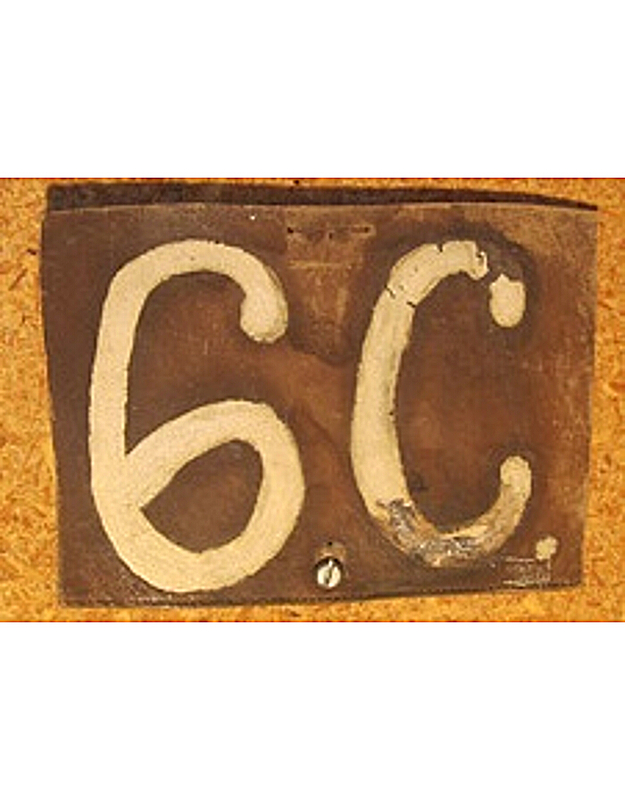 Most have only a single letter prefix to designate the locality, others used no identifying marks all. 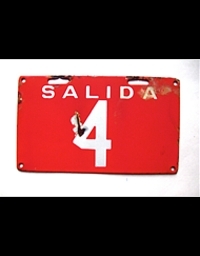 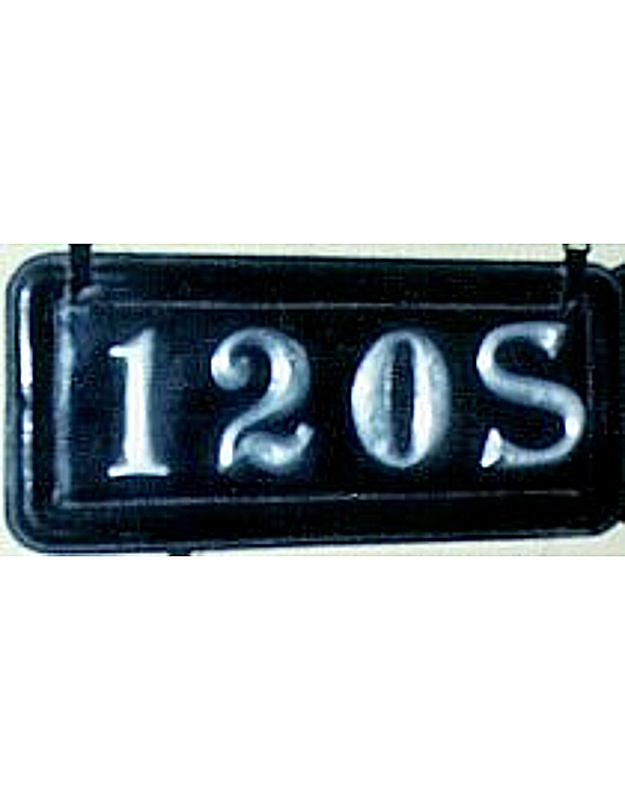 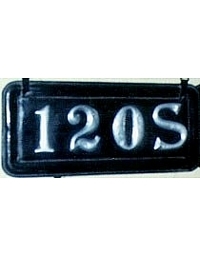 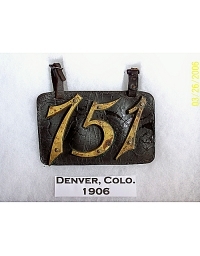 It is not known precisely how many Colorado cities had their own tags during the first decade, but a few are shown below. 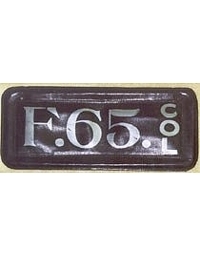 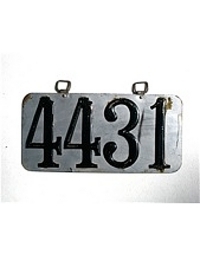 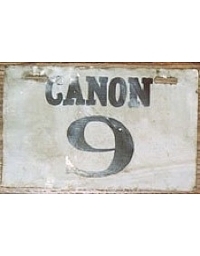 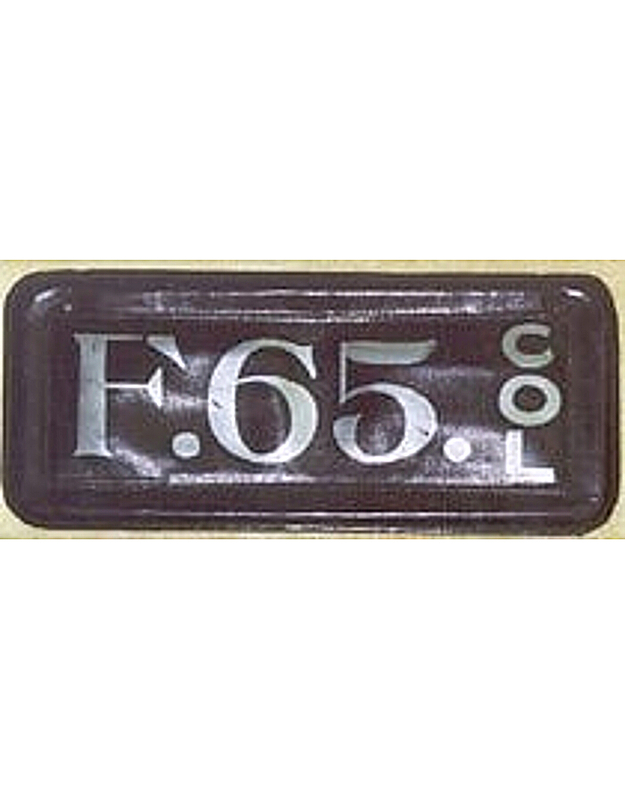 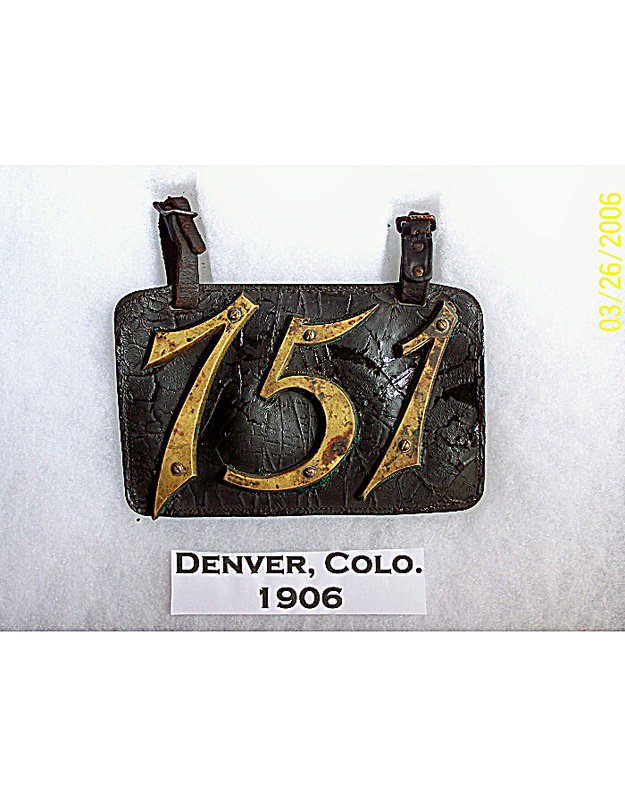 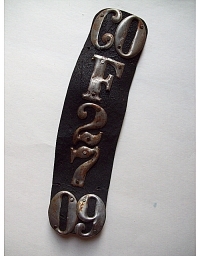 Denver tags can usually be identified by the specific “script” font and shape of the brass numerals. 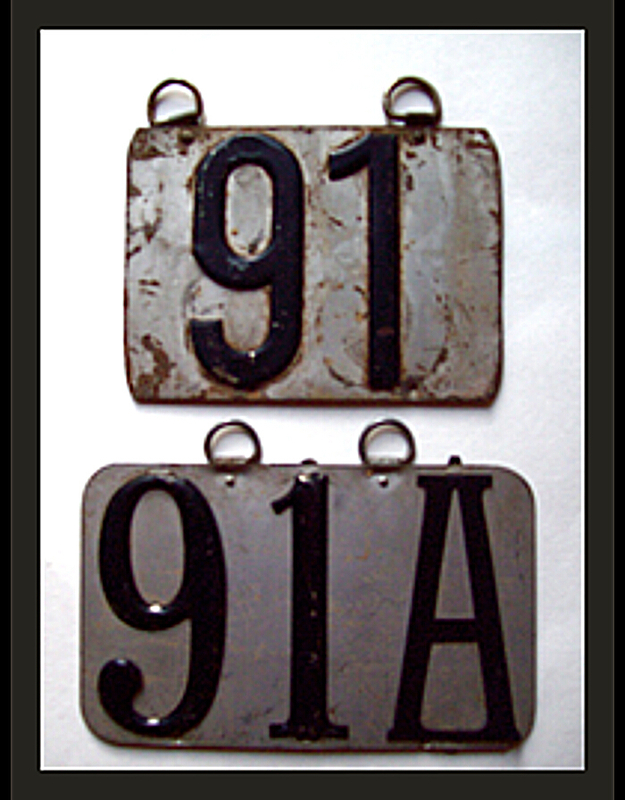 Only three Colorado city pre-state license plates can be positively identified from the 1901-10 period. 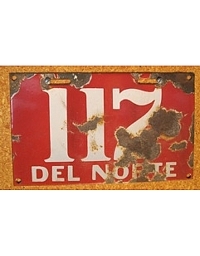 Salida and Del Norte had the foresight to include their names in full, thereby removing all doubt. 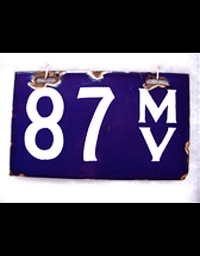 And the City of Monte Vista identified its tags with the initials “MV” as verified in local legislation approved in 1909. 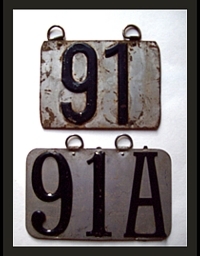 A few other Colorado cities issued tags with full identification after 1910, but those are beyond the scope of this survey. 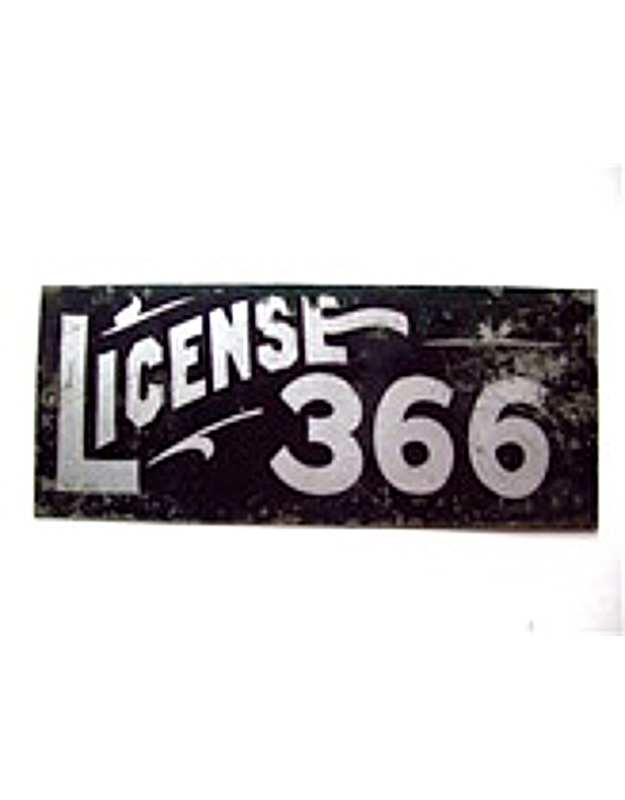 Other Colorado cities and towns known to have used pre-state licenses include: Alamosa (“A”), Boulder(“B”), Brighton, Canon City, Colorado City (“C”), Colorado Springs, Florence(“F”), Mancos(“M”), Rocky Ford(“R-F”), and Saguache(“S”). 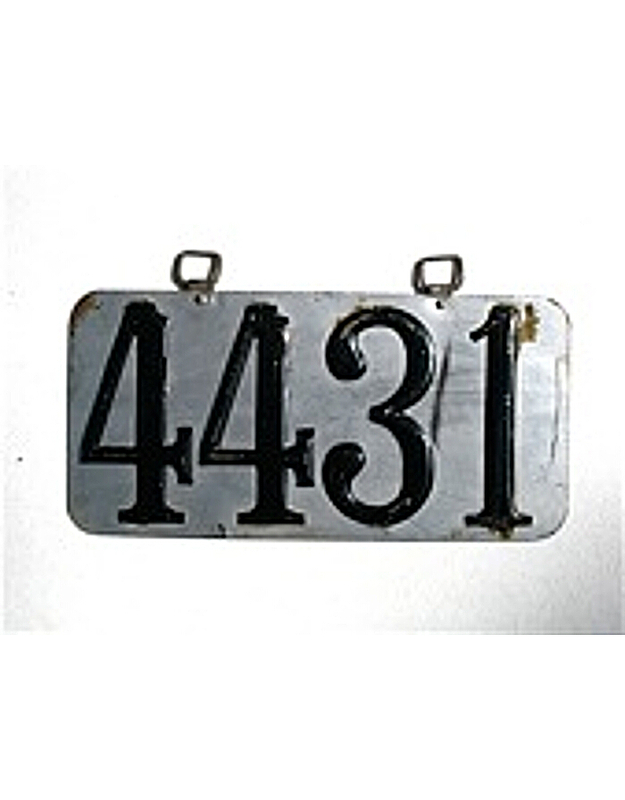 There are several Colorado local license plates known with an “A” suffix. 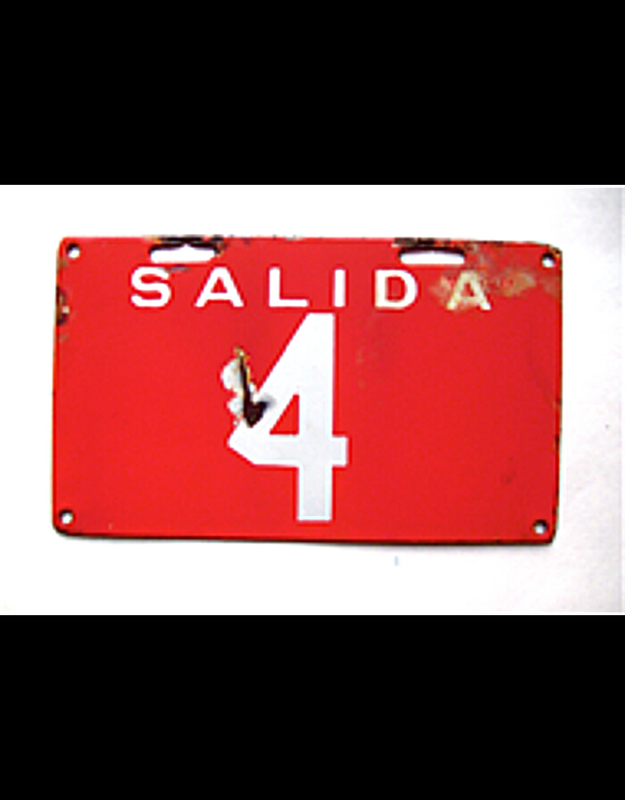 Some have speculated that these are from Alamosa, and perhaps certain ones are. 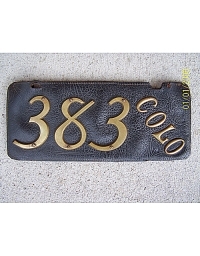 However, it is known that Colorado Springs, one of the largest cities in the state, required an “A” suffix to designate a second car or a transferred registration to a new automobile. 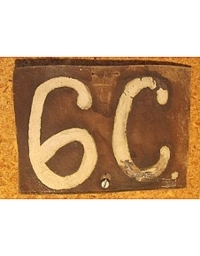 Perhaps other cities followed this practice also.